I am always looking for new ways to encourage kids to pray, especially to get them out of the rut of talking/asking/praising about the same things. I am just as guilty of this- I tend to remember to pray for the people I care most about, immediate situations, and my needs. The bigger picture and people I don't interact with are likely to be forgotten in typical daily prayer. Then I remembered this neat technique we used in a Christian club I was in during high school. It is about using your fingers as memory tricks to help you pray for a wider variety of people. Pinky Finger- Smallest and weakest finger-Pray for the sick, dying, weak, homeless, uneducated, etc. Middle Finger- Stands up tall- Pray for those in positions of leadership- The president, government leaders, principals, employers, etc. This is awesome! Thank you so much for sharing! God bless! This is so encouraging! Thanks! This is wonderful for our CCD children! I hope to use this year when I teach my 2nd graders about prayer. Great Barbara! Be assured of my prayers for you and your students! Will be using this today. Thanks! This is great! Can't wait to use this with my youth bible study group with on our lesson of praying for others! Thanks for sharing! Yay! So glad it will be helpful for you and the kids! This is wonderful. If you don't mind I may use it with my 2nd graders as a small prayer journal. I would use the hand to make five pages and focus each week on a different finger of the hand. We would focus on praying thoughtfully on each of the topics. Of course! What a great way to extend this idea! This is wonderful. I would like to use this for a discipleship course on Prayer for my 1st-6th graders. Thanks for this. Will use it in Sunday school tomorrow! Thank you for such a lovely printable. As a CCD catechist, I love this for my kids. I printed an extra one to frame and paint for my 'sacred space' in our home. A daily reminder that God is near and prayer is getting closer to Him. Thank you! I am glad that it will be a great reminder to you and your family! I love your printable! I wonder if you would be willing to make a similar one that aligns with Pope Francis' five finger prayer. It is similar but 3 of the fingers are switched around-- thumb is family and friends, pointer is leaders & teachers, tallest is government and authority, ring finger is the weak or sick, and pinkie is myself last. I would like to use your printable in my religious ed classes. thank you so much! Thanks for your feedback! I made this printable a while before Pope Francis was elected, but if I had only known....I would have waited and then it would have matched! I will keep your suggestions in mind, but since this was hand drawn, I would essentially have to start over. Not a bad request, but one that I will have to add to my to-do list. Make sure you follow my blog so that you will keep up when I add new projects. Thanks! Thank you for this! May I use it at a ladies retreat? I will place several copies on each table with colored pencils for the ladies to meditate and pray with during down time. That's great, Rebecca! Glad you like it! I just printed the Hands of Prayer sheet, I LOVE IT!!! Such a Blessing! Thank you!!! Really useful, thanks for creating this! I really like this. Can't wait to do this with my kids. Great idea! I want to say thank you for this idea. I really like it and will be using it with my young people in my church. I don't have a printer to print the one you have, but I am going to let my young people do their own hand. I think they will enjoy this. God Bless You! Thank you so much for sharing. I'm going to share this with my children. I tried to print it out and only a portion of it would print. Sorry you're having trouble, Linda! I checked and the links are all good. My suggestion would be to download the print to your desktop and print directly from there as opposed to printing from the browser. Hope that helps! I absolutely love this! I will definitely use this and teach my kids with this method. Thanks for sharing. Thanks for this. Its really cool. Thanq so much for ur ideas.. a gud start for new year.. Thanks so much for this resource! Just what I needed! 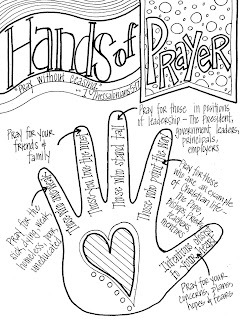 Something for my folks in senior care who love to color to use on the National Day of Prayer. Great idea. Thanks. Thank you. This looks fun and an easy reminder for all my fourth grade students. I know they'll love it!